Our tile sizes are described in inches. You will see common sizes such as 3×12, 4×12 etc. This indicates the length and width of the tile in inches. However, this is the nominal size of the tile, not the actual size. 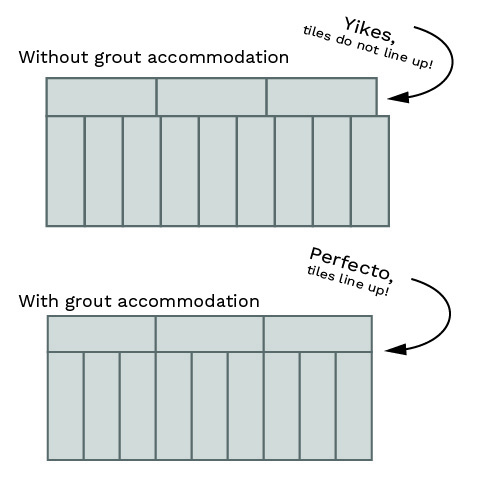 What this means is that the described nominal measurement does not take into account accommodations for a grout line. Our tiles are, in fact, designed in such a way that each measurement is 1/8” (0.125”) undersized. This is done to accommodate for grout line. 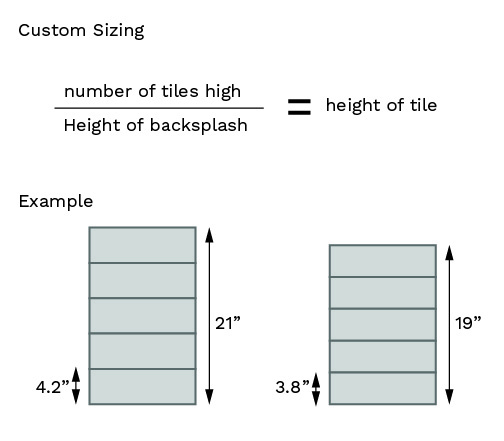 Below we will explain why this is important and why it should be considered in your tile layout. 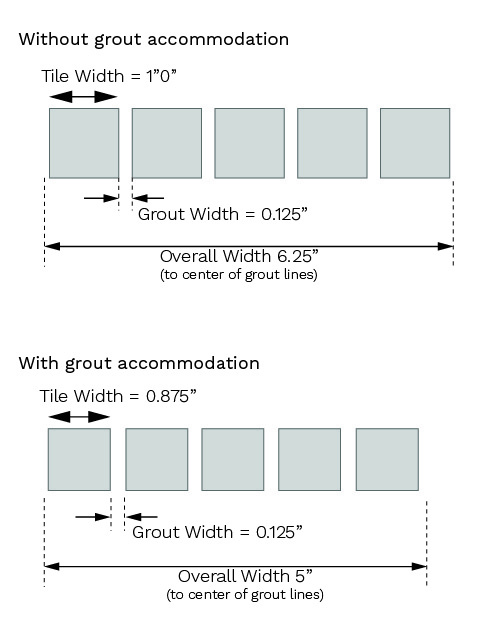 Accommodating for grout width is critical to tile layouts and tile design. The following illustrations clearly show what can go wrong, and why we take the care and consideration in our tiles to make our tiles install cleanly and correctly. Without grout-line accommodations the grout width would be added with every grout-line in the pattern. This effectively makes the overall width much larger, and more difficult to calculate. It also makes it almost impossible to lay out more complicated patterns. Although we make these considerations, a lot of manufacturers do not. In fact, many manufacturers are overseas and their tiles are commonly made to metric specifications. This is not usually an issue, but it is something that you must be aware of when laying out your tile patterns. Be aware and make sure to ask your supplier of nominal and actual sizing. For most applications and most patterns, custom grout allowances are not necessary. 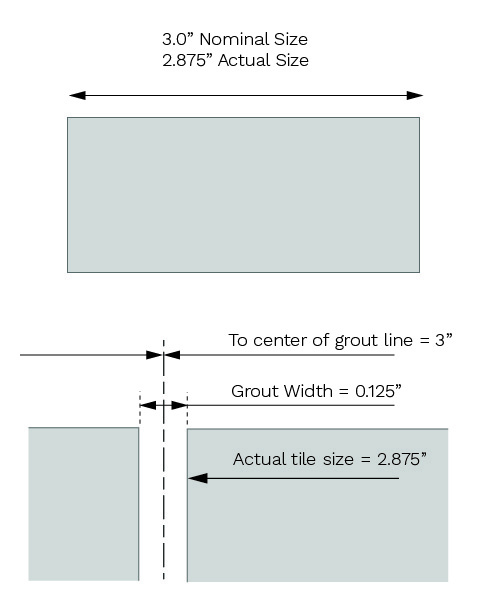 Even if you want a thinner grout line, it is not mandatory to create a tile with custom allowances. Not all patterns have this requirement. For the designer who has the need for a slightly narrow grout-line, no problem. Just let us know at the time and we can help you out. Geometry is nice on paper, and theories can be all good. But what are the implications in reality, and how can we use this information to make our lives easier? The answer is measure carefully, and predict your predicament. For example, if your backsplash is 18” tall, you will need to accommodate for grout-lines. With our tile this is no problem, because each tile is nominally measured from center to center of grout line. What this means is that if you stack 6 tiles with a 3” width you will have exactly 18” from center to center of grout line. This is a very common question and is sometimes tricky to decide. Here are some tips and tricks that can help you lean one way or another in terms of sizing. 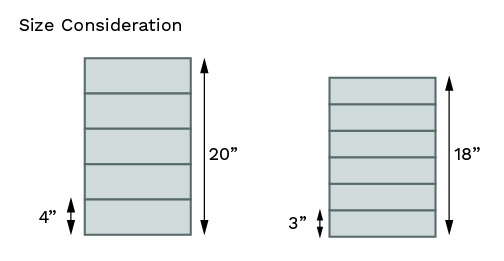 Generally for tile, the larger the are the larger the tile. For kitchen backsplashes most popular sizes are 3×12 or 4×12. If you are not sure which size to choose, the height of your backsplash may have the answer. This can reduce or eliminate the number of cuts, and it help to finish for a much cleaner installation. Although its not always possible to have an easy answer, this often will help. If you have an odd height backsplash, and really want a super clean installation, you might want to consider a custom size option. In this case we cut your tile to a perfect fit. Basically, the height of your back splash is divided by the number desired tiles in height, and you can get a perfect everytime. Shown here is an example for a backsplash, this applies to any area that is covered by tile. For designers and architects this can be a huge help, if not critical to a clean installation. No detail oriented person wants is to have a 0.5” sliver of a gap due to poor planning! This process does take a little more thought and planning, but it is good to know that we have this option for you.